Cleverly designed and beautifully decorative, this bamboo plant stand is ideal for both indoor and outdoor plant storage and display. Keep it on your office desk as a neat way to brighten up an often gloomy office environment, or keep it at home around your living room or in the hallway to greenify your interior decor! DECORATIVE BAMBOO PLANT STAND: This cleverly designed, narrow plant allows you to show of your succulents, cactii and other assorted small plants, features 3-tiers, and comes with 3 complimentary white ceramic pots. 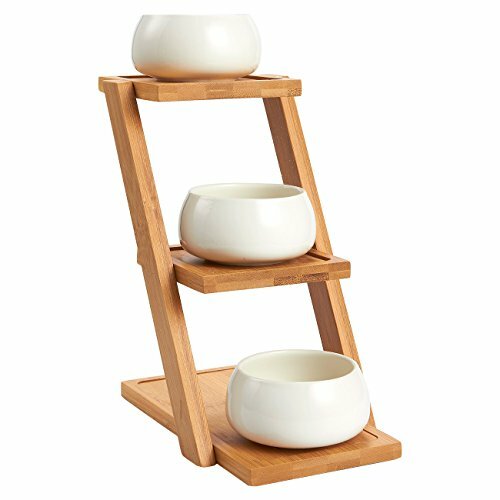 BAMBOO STAND, CERAMIC POTS: Thanks to its bamboo material, this staircase style plant stand and holder is sturdy enough to hold the 3 bonus miniature ceramic pots. Each ceramic pot has one drainage hole at the bottom. IDEAL FOR YOUR INDOOR OR OUTDOOR PLANT DISPLAY: Can be displayed indoors or outdoors with space for 3 plant pots, allowing you to show off your beautiful plants and succulents to guests or neighbors! CHARMING GIFT FOR GREEN THUMBED FRIENDS: A unique gift for housewarmings, a birthday gift for nature-loving friends and loved ones or a simple present for a garden-obsessed neighbor!